The Key of X features Ensign Broderick and Jónas Sen (solo artist and Bjork band member), Phillip Glass, Michael Snow and other icons of avant composition, visual art and film. 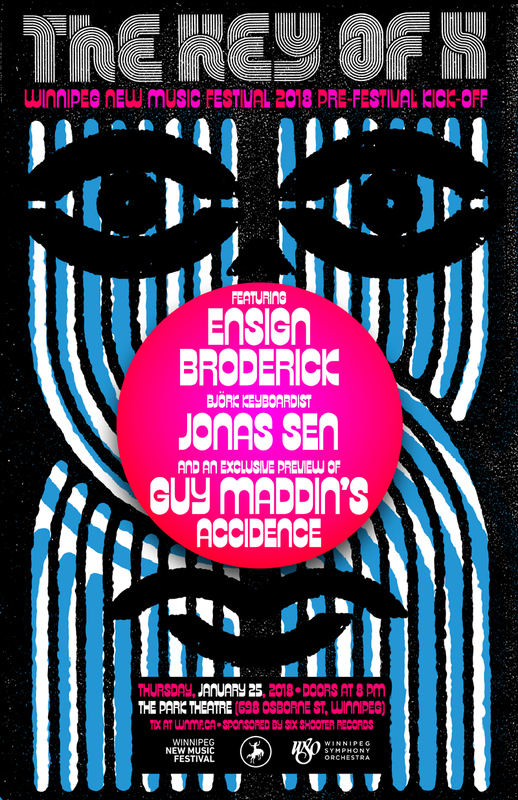 The event will also host an exclusive screening of new short film ACCIDENCE by Guy Maddin, Evan Johnson & Galen Johnson. Featuring Icelandic pianist, composer and frequent Bjork collaborator Jónas Senand the enigmatic Canadian experimental songwriter Ensign Broderick, who performed at Interstellar Rodeo, The Key of X brings elements of avant composition, improvisation and experimental filmmaking together for a night of nuance, complexity and beauty. Of special note is the exclusive preview of a new short film ACCIDENCE by Guy Maddin, Evan Johnson and Galen Johnson. – Ensign Broderick performance w/ string quartet. – Exclusive preview of new short film ACCIDENCE by Guy Maddin. Tickets for The Key of X are now available from the Winnipeg Symphony Orchestra. Buy here.